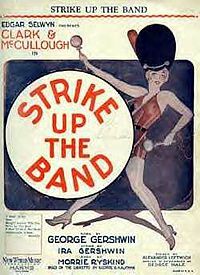 “Strike Up the Band” is from the 1927 musical of the same name. Although Strike Up the Band was not a big hit on Broadway, the song became extremely popular. When Gershwin moved to Los Angeles, he was approached by UCLA to help with a fight song and so he contributed “Strike Up the Band for UCLA”, which is still played at all football and home basketball games at the university. Please strike up the band! “Strike Up The Band” was recorded on January 5, 1959 and was released in 1959 on Basie/Bennett. The song was arranged by Ralph Sharon.